Foot care is essential for everybody but is especially true for diabetics. Expert podiatrists Vern Christensen, DPM, MPA and Jeffery VanYperen, Jr., DPM, provide wound care and other foot services for people with diabetes at Foot Specialists of Mississippi in Amory, Mississippi. If you’re looking for professional diabetic foot wound care, call or book an appointment online today. Diabetes increases your risk of various foot problems that people without diabetes usually don’t have to worry about. One of the primary concerns related to diabetes is peripheral neuropathy, a painful condition that causes nerve damage. Neuropathy can cause you to lose feeling in your feet, which makes it difficult to sense pain or extreme temperature changes. Consequently, you may not notice an injury such as a serious cut, wound, or foot ulcer on your foot because you don’t feel it. Without proper wound care, this can lead to serious infection. About 15% of people with diabetes get a foot ulcer, or open sore, on the bottom of their foot. Of these patients, about 6% become hospitalized due to infection or other complications related to the foot ulcer. While a wound on your foot may not sound like a serious medical condition, foot ulcers are responsible for about 85% of diabetes-related amputations. Dr. Christensen and Dr. VanYperen are highly trained in caring for diabetic feet. In addition to providing expert wound care, they educate you on how to protect your feet at home. When should I see a podiatrist for diabetic foot care? If you’re one of the 30 million Americans with diabetes, it’s crucial to see Dr. Christensen or Dr. VanYperen for annual foot care visits. During your exam, they carefully check your feet for signs of wounds you may not have noticed, such as broken skin. They also check for loss of blood circulation or areas or other changes in your feet. You should schedule an appointment any time you notice a wound, ingrown toenail, bunion, or corn. Never attempt to cut or remove corns or bunions on your own, as this may cause infection. How do you treat foot wounds? 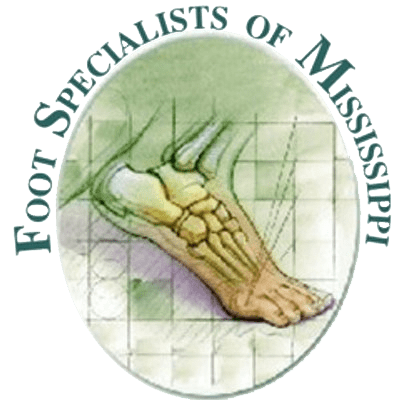 The sooner you schedule an appointment at Foot Specialists of Mississippi, the easier it is for Dr. Christensen or Dr. VanYperen to treat your wound. For wounds that are already infected, they may prescribe antibiotics. In severe cases, they may suggest you go to the hospital. If you have diabetes and notice a wound on your foot, call or book an appointment online right away.